Moosup – Gerald N. Chenail, age 86, of Moosup, CT, passed away at Davis Place in Killingly, CT on Jan 15, 2019 with his entire family by his side. He was born in Wauregan, CT on Aug 3, 1932, a son to the late George and Cora (Baril) Chenail. Gerald was married on Jan. 16, 1957 to his wife Joyce P.A. (Doyle) Chenail. She survives him. 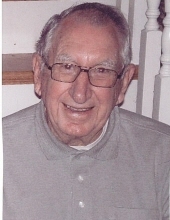 Gerald attended Sacred Heart School and was a graduate of Plainfield H.S., Class of 1950. He served in the US Army from 1956-58 and was honorably discharged at the rank of SP-4. He was employed at the former Wauregan Mills and Plastic Film Corporation. Following a 5-year apprenticeship, he spent a majority of his 39-year career as a Senior Mechanical Design Specialist at Electric Boat retiring in 1991. In his free time, he loved spending time with his family, traveling, fishing and golfing. His most notable sports achievement was scoring a hole-in-one at Putnam Country Club’s 11th hole in 1993. In addition to his wife Joyce, Gerald is survived by his four children and their spouses Peter and Carole of Griswold, Thomas and Pamela of Plainfield, Paul and Patty of Moosup, Mary Tobaygo of Moosup; brother Richard Chenail of Moosup; sister Rachel Silva of California; five grandchildren Nathan Tobaygo, Katelyn Chenail, Jacklyn Ross, Kyle Tobaygo, Michelle Chenail; one great grandson and one great granddaughter. Gerald was predeceased by two sisters Jane Prairie and Olive Chenail; brother George Chenail and son-in-law Robert Tobaygo. A Mass of Christian Burial will be held on Saturday Jan 19, 2019 at 10:00 AM at All Hallows Church in Moosup, CT. The funeral will assemble at church. Burial will follow within All Hallows Cemetery. Visiting hours will be held from 5:00-7:00PM on Friday Jan 18, 2019 at Dougherty Brothers Funeral Home 595 Norwich Road, Plainfield, CT. In lieu of flowers, donations may be made to Center for Hospice Care of Southeast CT, 227 Dunham Street, Norwich, CT 06360. To send flowers or a remembrance gift to the family of Gerald N. Chenail, please visit our Tribute Store. "Email Address" would like to share the life celebration of Gerald N. Chenail. Click on the "link" to go to share a favorite memory or leave a condolence message for the family.